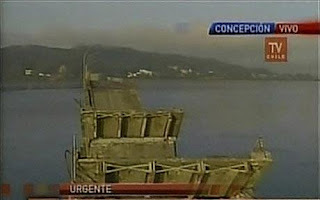 Collapsed bridge into river Biobio near Concepcion. Chile Earthquake. February 27, 2010. Photo Reuters. Chile was hit overnight by an 8.8 plus earthquake. There are Tsunami warnings from South America to Hawaii, to Aisa. A small Tsunami has already been reported. Over 80 people have already been reported dead by the Chilean Interior Minister. There is wide-spread structural damage. UPDATE 8:20 AM PT: The number reported dead has been increased to over 120, according to the President-Elect of Chile. I've been watching Live TV streaming from Chile. A Tsunami Evacuation Order is posted for Hawaii. If you live in the Islands, evacuate from anywhere near the ocean. Close the computer NOW and get to high ground. A possible Tsunami is being warned for parts of California. If you live anywhere on the Pacific Coast anywhere, PAY ATTENTION. This means anywhere from Australia and New Zealand to Japan, from South America to Central America to Mexico, to California (San Diego, LA, the mid-coast, San Francisco Bay, Northern California), up through Oregon, and up the Washington Coast, to British Columbia and the Yukon, and ALL THE WAY to Alaska. TURN ON YOUR RADIO and PAY THE FRACK ATTENTION TODAY. Big Water is on the move all across the Pacific Ocean and where it will move, where and when it will come ashore, no one is yet quite certain. UPDATE: Actually, NOAA knows how the water is moving, when and where it will come ashore. Except for the aftershocks that is. But based on the ORIGINAL 8.8 mother-fucker, look at the MAP which is trying to appear below. If a really cool mostly yellow/red/blue map isn't there yet (if a text line below this paragraphs says "view-source:http://" followed by a URL of some type), then click on any NOAA knows link, then click back to GNB -- the backspace button -- and the map will shortly appear below if it hasn't already. To see the map BIG, click any NOAA knows and then click on the Map again. Gawds I LOVE scientists. They are so cool. Look at what they/we can do! Aftershocks -- BIG aftershocks -- are still happening. Five point five so far plus/minus. It's not at all out of the range of probability (let alone possibility) that we'll get a 7+ aftershock, and yeah, that could set water moving again. TWITTER has amazing reporting. Check #chile, #earthquake, #tsumani, #redcross. Please add more info as you have it in comments. I'm posting now rather than trying to gather more. Disclosure: I have close friends in Chile. My most influential mentor ever (I worked for him for six years, traveling everywhere with him) is currently a two-term Senator in Chile (one of 38 Senators) and ran for President of Chile. I've twitter out looking to see if they're alright, but like most people with folks in the target zone, I'm just waiting for him to surface and post something, anything, that says he and his family and staff are personally alright. His Senate Seat is way out of the zone. But Santiago, the capital of Chile (where the Senate meets) is kaBAM, right near the epicenter. And got hit hard. Updates: I've been updating off and on during the morning. What you're seeing now is NOT what I originally posted back around 5:35 am PT. Lots more date, photos, maps, stats, links, commentary.